Lou DiBella – I’m happy to be on this call for PBC on NBC as the heavyweight world champion, Deontay Wilder, returns to Birmingham, Alabama on September 26, Saturday night, live on NBC 8:30 p.m. ET/ 5:30 p.m. PT. As he takes on Frenchman Johann Duhaupas who has 32-2 with 20 KO’s and coming off a win against title challenger Manuel Charr. The significant thing about this card is that this is the first time in 30 years that a heavyweight championship belt will be contested on primetime, free television. The last time that happened was when Larry Holmes fought Carl Williams in 1985 so Deontay is making some history here. This is the third fight of the year for Deontay Wilder who won the title in January, defended it in June, defending it again in September, so it’s a great thing that this young heavyweight champion who is still a work in progress is fighting with this kind of frequency and attempting to build his reputation and his skill set and to continue to dominate the division. A number of shows in the past were fights with young heavyweights and to a large extent that’s what this fight card is. It’s the heavyweight championship of the world in a main event and in the fights that precede it, undefeated heavyweight Dominic Breazeale, who was the quarterback at the University of Northern Colorado before picking up boxing, will be fighting a tough fight against Fred Kassi who had a draw in a fight with Chris Arreola. That is our opening fight on NBC and also on the card, undefeated American heavyweight Charles Martin, 21-0 with 1 draw and 19 knockouts, will be fighting. Three undefeated American heavyweights, one undefeated American heavyweight champion. So it’s a really significant night of heavyweight boxing. Legacy Arena in Birmingham, Alabama. Tickets are priced at $300, $200, $125, $65, $45 and plenty of tickets at an affordable $25. They’re on sale now. For tickets, visit the Web site AlabamaTitleFight.com. 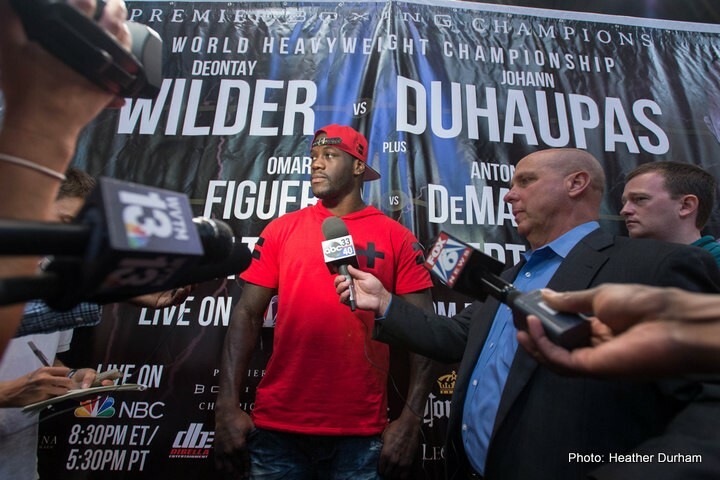 Duhaupas is making his US debut on September 26th coming off a big win against Manuel Charr. He turned pro in 2004, won his first 17 pro fights, he’s had various titles; French titles, South American titles, Mediterranean heavyweight titles, over his 11-year career. Fought in 10 different countries so he’s used to being on the road. He’s a legitimate, ranked heavyweight contender, never been on his back, never been knocked-out, so if Deontay can knock this gentleman out, it’ll mark the first time that’s ever happened to Johann Duhaupas. Johann, do you have a few words? This is a big fight for me, the biggest fight ever for me and I’m really happy and wants to thank everyone for the opportunity to fight in the U.S. and it’s very important to me. It’s a big fight against one of the best fighters right now in the WBC and I’m really happy to fight him. Thank you. Now over to the Champion and, it’s interesting Deontay Wilder has a great story and not everyone even to this date knows it. He’s only 29-years-old but did not begin boxing until the age of 21 after his daughter was born, that was an incentive for him to pick up the gloves and try out the sport. His rise has actually almost been meteoric. Despite his late start in the sport, after only a couple of years, he went on to represent the U.S. in the 2008 Olympic Games where he won a Bronze medal. He’s the last American male boxer to medal in the Olympics. The undefeated heavyweight champion of the world, 34-0 with 33 KOs. The pride of Alabama and best young heavyweight fighting in the world today, Deontay Wilder. Deontay, will you say a few words? How are you guys doing? I’m excited about the fight; I’m excited about bringing it back to Birmingham, Alabama. Once again, when I began having title fights, having fights period in the State of Alabama, I didn’t see this coming that I would have a title fight and then have one right after another. It’s just a blessing to me and God is good and I’m looking forward to this fight. The people have responded; they’re looking forward to a great fight as well. It’s going to be a packed crowd and they’re looking forward to a great fight. I’m excited about to defending my belt once more against to the Frenchman, Duhaupas. I couldn’t have a better opponent to be defending my title against. I think he’s the best type of opponent for me. He’s tough, he comes to fight, he’s got a great record, he’s never been stopped, he got the height and the weight. Do I have to say more? I think this is a great opponent for me, I think this is a great fight despite of what maybe critics may say about it. They’re going to see this is a great fight, this is an exciting fight, this is going to definitely be a tough fight and I’m looking forward to it. This type of boxing in the heavyweight division is back and I’m happy that I’m leading the pack. I’m back, I’m going to bring even more exciting fights and I can’t wait to get this on, I can’t wait. I’m definitely an active champion; once I became champion, I told people that I want to stay active and I’m looking forward to continuing being active in and outside of the ring as the champion, defending my belt as many times as possible. I don’t see myself being in this sport a very long period of time so I want to fight as much as possible. I want to defend and put my title on the line as much as possible. If the top fighters in the division are ready, they’re coming to try to come and take my belt — and the key word is try. I’m ready to give them the opportunity and I’m looking forward to it. I’m looking forward to it and I thank Duhaupas for accepting the challenge and I know he’s going to bring a great fight and welcome to Alabama. Thank you, Deontay. I just want to reiterate the PBC on NBC telecast will begin at 8:30 pm ET/ 5:30 pm PT. The doors will open at the Legacy Arena, Birmingham for a great undercard at 4:00 with the first bout beginning at 4:30 pm. We have a young heavyweight champion who is truly committed to excellence and improvement. Three title fights in under nine months, Wilder will have fought by the time September comes to a close. I can’t remember the last time there was a heavyweight champion that fought three title fights in under 9 months and I would like to open it up to questions so any questions for Johann Duhaupas or World Champion, Deontay Wilder. Do you feel that you need to have a knockout to gain more fans or to increase your legacy or are you okay just out boxing this guy, winning by decision? Well, with Duhaupas, he doesn’t know what it is to be knocked-out and I feel that I definitely have to win this fight by knockout. I want to get him his first knockout. That’s for sure. I’m a proven fighter all the way around. Once I became champion, I showed people what I could do; I can take a punch, I can give a punch, I can go rounds and all that so as far as keeping my legacy alive, of course I want to continue with the knockout spree but sometimes you get those guys that can take a punch and we’re going to see that — can Duhaupas take a punch? He’s never faced a guy of my caliber, with my speed, with my talent, with my IQ in the ring, with my power and we’re going to see how the fight plays out but I definitely feel that I need a knockout in this fight. What’s the goal for the Deontay Wilder brand? Do you want to be a PPV star, are you just trying to rack-up defenses and build a legacy one fight at a time? I’ve never had the goal of being a PPV star. If PPV comes, PPV comes. I’m all for the people. I know everybody can’t afford PPV and I love fighting on SHOWTIME and I love that I have the opportunity to fight on NBC, which hasn’t had a heavyweight title fight in over 30 years and now I get this opportunity. It’s the first time since 1985 and this is free TV so these moments inspire me. I don’t have a goal to be a PPV star. I want to be where it’s affordable and people can watch and appreciate the sport of boxing as I defend my title. My main goal is to defend my title as much as possible and my ultimate goal is to be the undispute heavyweight champ of the world. Are you looking to make heavyweights relevant again in the U.S.? Every fight is not going to be the fight that people may want to see. Some people may want to see other fights but people have to understand that it’s not going to be the big fight all the time. The thing about people, they look at records, they look at who the last person’s fought, which for me means nothing. When you give a man that’s in poverty, give him an opportunity, give him a key to that gate to say, hey, if you unlock this gate, this right here can show you more than you ever had in life, you can support your family, you can do more than you ever done in your life. Give a man that opportunity and you see what type of fighter he turns into in that night of the fight. You could have the best record in the world, but when you get in that ring on that night, we’ll really see what’s you’re made of. I don’t think records make a person. I think certain opportunities brings something special out of people; they’re willing to die in the ring. We don’t want the guys that want the money, we want them to have the opportunity of trying to come and take this title. I say the key word is try, that’s the type of fighter that I like; the opportunist instead of the money and I think Duhaupas is the guy that wants the opportunity because he want to be the first Frenchman, the first heavyweight champion of his country so I know that he’s going to bring everything that he has to this fight. If it was a regular fight, many guys would have laid down at the first punch when they got knocked to the canvas. Due to the fact that many of these guys realize that this is my big opportunity to live my life like I want, they gets up each and every time and that’s what we look for. How quickly can we see you in the ring with Klitschko? Well right now you all already know what it is. At this point in time it’s all about Duhaupas. This is all about him. Everything else is in the future. Right now, this is the present; this is currently what’s going on with Duhaupas. I can’t look past nobody else. We’ll have to see in the future but right now, I’m worried about what’s in the present. Deontay, you said earlier that you don’t expect to be boxing for a very long time. Could you tell us a little bit about what your thoughts are on that because you’re really just still defending, I don’t think you’ve reached the best that you can be at this point? Oh most definitely. I’m looking to have maybe 10 years in this sport. 10 years I feel that, especially at the capacity that I’m going with defending my titles and the things that we have planned and lined-up, I think 10 years will be a long reign for me to accomplish everything that I want to accomplish in boxing as far as getting all the belts and different other things. I have so many things that I want to do in my life and I just don’t see myself being a fighter forever. This is my love and my passion and it also opens up and sets other things in my life as well so that’s why I say it’s going to be a short title run, which a decade is. Many fighters may not have a plan after boxing. For some fighters, boxing is all they is and all they know, but for me, I have other goals and plans in my life that I want to see myself accomplish. Have you watched video of Johann and do you have any views on what you think your strengths are against him? Right, well I think my strengths for Duhaupas are that I’m faster, I feel I’m stronger, I feel that my IQ in the ring is going to be a little bit better, my footwork is quicker than he’s ever seen within a heavyweight. I feed off my opponent, I feel them and I go from there. It’s easy to look at a man on the outside of the ring, but when you get inside the ring and in front of the man, it’s different. It’s a different fight, it’s a different game and I think that my challenger is going to agree with me once he gets in the ring with me and see what I’m talking about. You’re obviously going to have the fans on your side in this fight in Alabama, in the United States. How much of a difference does that make for a fighter? It makes a huge difference. It definitely does, you’re fixing to go in there and give it all you got because you at home, you definitely don’t want to lose at home that’s for sure. It can be something that’s for you or it can be something that’s against you. Sometimes, being at home fighting in the big crowd at home where everybody knows you, it can be a lot of pressure. I’m not the type of guy to panic under pressure in those situations or circumstances but it could get to that point where they want to see a certain thing or they screaming your name and you want to hype the fans up so you want to go in, throw a couple of shots and even if the shots ain’t there, you just want to go in there and rile the crowd up and stuff like that. Maybe I would have done that earlier in my career, but now I’m more mature, more experienced in the ring. I’m like a quarterback that’s in a rivalry game. I like it quiet, then when I make my attack and do what I have to do, then knock them down, that’s when I want them to cheer. But sometimes it can be difficult fighting at home where everybody loves you. But I enjoy it and I’m looking forward to many more. Johann, you’re going to be fighting in the US for the first time in Deontay’s home state and the fans are going to be cheering for him, most of them. How do you think that’s going to affect you? Is that going to have any effect on how you approach this fight? That’s a big challenge for me. This is something I’ve dreamt of for years. Once I am in the ring I forget everything about where I am, I just think about fight and just focus on the fight and the opponent and it will be a normal fight for me. It’s really important for me because it’s a big fight in a big country and until the fight, when I’m in the ring, everything is the same thing that it would be in France or anywhere. Can you see any advantages that you have over Deontay? This is a huge fight here but I can use some special things for me to fight against him. We’ve been working a lot in the last month on Deontay fights and watching videos from him. We work a lot to bring a hard to fight and we’ll be prepared for the fight. I’m prepared for a fight and I know how to do it. Your old sparring partner, Wladimir Klitschko had some comments urging you to face better opposition. Do you think Wlad should mind his own business when he’s making these kinds of comments about you? Most definitely. You said it perfectly. Most of the time, whether people say things about me or write about me, I don’t see it myself or most times people bring it to my attention and that’s one of the things that my brother brought that to my attention and I laughed, I almost laughed all day about it, because for him to make that statement, basically is for him to really criticize his own self or to talk bad about himself because if he’s talking about opponents or whatever, he’s been doing the same thing for over a decade. He’s been fighting guys we don’t know names of or how to pronounce or where they came from. they came out of a rabbit box, you know. So for him to say that is very laughable to me. How do you just respond to people in general about what people criticize the type of guys that you’re fighting? Well, as far as other people, they’re not in the ring. I don’t care about what other people think about it. For him, being a champion for so many years and having done that, then trying to go back on maybe talking about opponents. He already knows what it’s going to be when he faces me so of course if I fight everybody at the top, then that lessens the chance of him having to face me because of course I feel he wants me to lose somewhere around there so he can have a easier match for him when it’s time for me and him to fight, which is not going to happen. But for anybody else, especially if you haven’t been in the ring before, I don’t really care. I don’t care about what people write, I don’t care about what people say. I don’t even read anything. All I do is train and that’s my life. I train and I go do charity things sometimes, I go do a lot of media stuff sometimes, I spend time with my family, that’s about it in my life. Other than that, people can’t get mad about what people say about people. You know, I’m winning. I’m winning in the ring and I’m winning in life and my family is taken care of so as long as those things continue to happen, I’m happy. Do you see yourself as being in position to one day carry the mantle of boxing as Floyd Mayweather once did? Oh most definitely. After Floyd went out, up pops Deontay Wilder. That’s the plan. That’s always been the plan and I’m making sure that that plan is played out like it’s supposed to. I am the heavyweight champion and the heavyweights are the cream of the crop and now it’s our turn. We’re bringing it back. Floyd has done a marvelous job with his career and stuff like that but now it’s my turn; now it’s time for the big guys to rule the division like they once were and I’m the man for the job. Johann, could just give us an update on how training camp is going? I want to keep all my secrets for me. The thing is I work with a lot of videos of Deontay fighting. I think we’re preparing the fight the best we can do. We’re just training in my town in France because I need to train close to my family. I like to prefer to train here because I know the place and the people and that’s it. Deontay, you talked about how you thought Johann was a really appropriate opponent for you. Why do you say that? Why is an opponent of his size a guy you’re looking to go after right now? Because he’s got the size that we’re looking for, he’s got the nice record, he’s never been stopped, he’s damn tough and that’s what we need. We’re looking at the bigger picture besides him and like I said, my goal is to be the undisputed heavyweight champion of the world and the people that we pick, the things that we do, we do for a reason. We don’t do it just because. Every guy that is in our planning and we were definitely looking for a certain type of European fighter as well too and Duhaupas fits the description. He fits it well and I think he’s going to definitely come to fight. People just got to stay patient and go along with the flow whether they like it or not. If they like it then good. Can you talk about, how important that is to you to bring heavyweights back to the forefront in America by fighting on prime time? The heavyweights are definitely coming back. I’m just excited to be a part of it. Not only just me but we have a lot of other guys in the heavyweight division and it’s been a long time overdue and now it’s the time for the big guys. Our time has come around and it’s very important because everybody always dwell on the past and back in the day and they can’t get past back in the day where today is a new day. It’s a new era of boxing, it’s a new era of heavyweights and they have to get comfortable with what’s going on in your generation, you know? Past generations, that was the past. You have to move forward and look forward to the new generation and get closer to it and right now this is what the generation is. Being at heavyweight, the heavyweight family in general is a small community anyway with the heavyweights people just have to be patient and wait on the things a lot. A lot longer than these smaller fighters because there’s so many smaller fighters and they can continue to fight different kinds of fighters all the time but the heavyweights, you get good fights and you get what people don’t think is so good of a fight. You get a good fight you think, if I fought every guy in the top five all the time, then I’d get rid of all of them, then there won’t be anybody to fight, so you got to pace it. You got to fight a great fight then you go down and you fight maybe a mediocre fight then you get a great fight, then you go back down due to the fact that there are not so many heavyweights in this division. But it’s very important to bring it back. I’ve always been the man for the job. Now that I’m in office, I’m going to make sure we make the right decisions and we going to take each and every opponent out accordingly and I will and still will be the heavyweight champion of the world, and soon to be the undisputed heavyweight champion of the world. This is exciting, I can’t wait. What does it feel like this time around fighting when the University of Alabama football season is taking place right now and I understand you’re engaging with the football team in different ways? Do you feel the Bama pride more in the city and what exactly does that feel like? It feels great. The way I see it is that we’ve got a lot of things going on right here in the state of Alabama, that’s the way I feel so we’re winning all the way around in the sports department. I think it’s a great thing that Alabama is playing and now you’ve got another Bama boy, that’s the world champion, Deontay Wilder, fighting. I would love to see one day where they’re playing at home, people come to a game in the daytime and then at night, they come to a fight. That’s bringing in money and definitely revenue to the state of Alabama. Just imagine that people could just sit around, lounge around like, all right we go to a game in the daytime then we sit around and go to the fight. That’s a great weekend all around so anything for the state of Alabama, we definitely take in consideration. I definitely take pride in being from the sweet state of Alabama. They’ve shown me love from the start and they even showed me even more love right now as the champion that I’ve decided to stay here in the city of Tuscaloosa, in the state of Alabama when I could have been anywhere in the world. I could have been anywhere in the world but I chose to stay here because I had a vision, I had a plan that I wanted to do and everything is going great so good luck to the Crimson Tide as they have their game and I’m definitely going to handle my business that night. Thanks everybody for being with us. One more time, it’s PBC on NBC. Saturday, September 26th, 8:30 pm ET/5:30 pm PT. If you come to the Legacy Arena in Birmingham, Alabama, great seats $300 all the way down to $25. You can get them at AlabamaTitleFight.com and for everyone that can join us in Alabama; the doors will open at 4:00 with the first bout at 4:30 pm. Thank you Johann, thank you Deontay and thanks everybody for being with us.